The very first sentence of this whimsical introduction to Irish philosopher Berkeley (1685–1753) gives away the game: Strathern (Foucault in 90 Minutes, see below) declares that Berkeley’s work is “ludicrous” and “gives philosophy a bad name.” Eventually he backpedals and finds a few positive insights lurking in the murk of Berkeley’s tortured lucubrations, but he can’t quite bring himself to take the bishop seriously all the same—which is just as well for us. 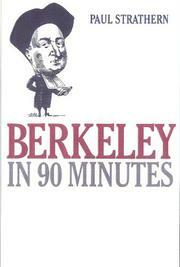 In between amusing but unconnected anecdotes about Berkeley’s life, Strathern does manage to touch on the philosopher’s most famous idea (that “the material world didn’t exist”)—although he can’t refute it quite so well as Samuel Johnson did (by rolling a large stone into Berkeley’s path). Although he does not consider any other 18th-century thinkers in detail (Adam Smith is briefly mentioned), Strathern does touch upon Berkeley’s friendship with Jonathan Swift. Presumably intended for college students who can’t be bothered to read primary sources, Strathern’s quixotic portrait isn’t likely to improve their grades—although it will certainly provide a laugh or two.